Ragi Peechappam (Steamed finger millet appams) is a healthy guilt free recipe that can be served as breakfast or as snack. 'Peechappam' means a sort of pressed appam that is made by pressing the dough balls making finger indentations.My MIL makes peechappam with rice flour and sugar and that's how I got familiarized with this snack.Ragi flour(finger millet flour) is a very healthy alternative to rice flour,rich in calcium and iron.I have used jaggery in place of sugar too.My kids loved this snack very much and I make it quite often.They taste almost similar to kozhukattas but here there is no filling and the filling is added to the flour and made dough,you get a taste of coconut flavor each time you bite through.These are much easier to do than making kozhukatta.Do try & enjoy !! 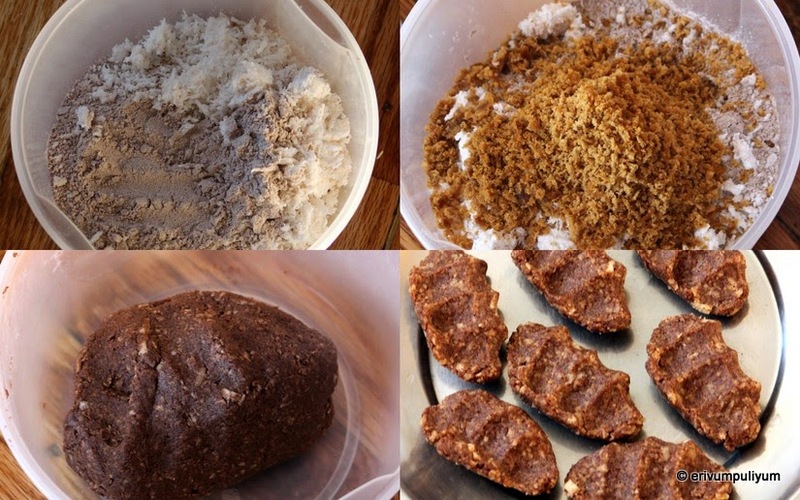 Roast the ragi flour in a pan for 3-4 mins until the raw smell disappears.Let it cool,then add in grated coconut,jaggery,cardamom powder,cumin powder,salt.Mix well,add in the boiled water like for idiyappam and knead like a dough for 2-3 minutes till you get a firm but smooth dough.Let the dough rest for 5-10 mins. In the mean time,add water in the steamer and bring water to boil.Pinch out small lemon size balls and then press the dough in your palms using your fingers make indentations.Repeat the same step till you finish the dough. Place the appams in steamer and steam cook for 6-7 mins on medium flame.The color changes to deep brown/coffee brown in color. Cool slightly,serve warm with milk !! * I have grated the jaggery and used as the jaggery that we get here hardly has any impurities.But you can always melt the jaggery,strain the impurities and add.In that case,adjust the water to the dough accordingly. * Adding cumin powder is optional,you can omit if you don't like the flavors. love this steamed sweetened ragi appam anytime...delicious and healthy too. Super healthy! I need to try this.. This is something new to me.. sounds delicious and very healthy. Which brand of ragi flour do u buy Julie? I made ragi puttu and I almost needed a stick to push it down the throat :) peechappam looks like no filling kozhukatta version sounds yumm and looks soft. Thank u Julie :) will look for it next time I go to Indian store. Tried this recipe today: DELICIOUS. Thank you for sharing this recipe.